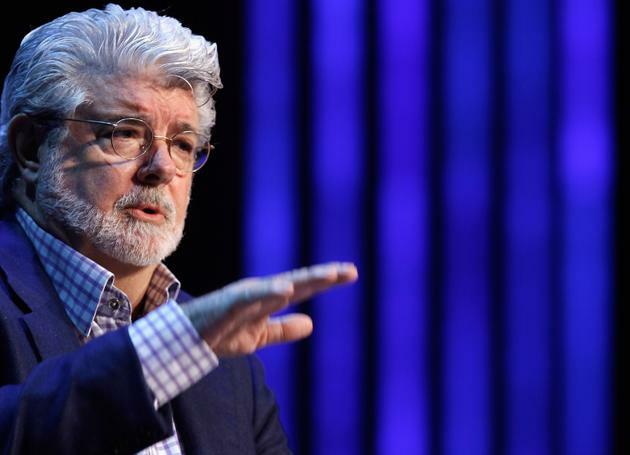 SAN FRANCISCO—George Lucas is best known for creating some of the biggest Hollywood blockbusters in history, including the “Star Wars” and “Indiana Jones” series. Now, several months after he sold his groundbreaking movie studio, Lucasfilm, to Disney for $4 billion and announced he was entering semiretirement, the legendary filmmaker is looking to shift into a second career: museum curator. On Monday, Lucas will appear before the Presidio Trust in San Francisco to present his proposal for a museum dedicated to “visual storytelling,” to be built in the former military base turned national park. To be called the Lucas Cultural Art Museum, its exact site would be Crissy Field, a former U.S. Army airfield located in the shadow of the Golden Gate Bridge. It would be filled with Lucas’ vast collection of illustrations and pop art dating back 150 years and having an estimated worth of more than $1 billion. Lucas is one of three finalists vying for the Crissy Field spot. The other two proposals: the Presidio Exchange, a venue sponsored by the Golden Gate National Parks Conservatory that would feature revolving arts and cultural exhibits and performances, and an institute focused on sustainability proposed by the Washington, D.C.-based Chora Group. Lucas says he's pitching his museum both as the world’s first cultural institution to celebrate "creative innovation” in the art of telling stories, and a place to inspire the imagination of future generations of visual artists—just as he was at a young age by artists such as Norman Rockwell and Maxfield Parrish. One thing that makes Lucas’ proposal distinctive—aside from his fame—is his offer to pay for all construction costs, an estimated $300 million. Also, Lucas says he would set up a $400 million endowment upon the museum’s opening and give another $400 million to the facility later. Lucas has joked that the idea of building a museum came to him when he ran out of space to hang his artwork at Skywalker Ranch, his 6,000-acre film compound in Marin County outside San Francisco. According to his office, Lucas’ collection, which began nearly 40 years ago when he bought an original comic illustration of Uncle Scrooge, is so extensive that it would take six years to see it all if you were to rotate exhibits every six months. Most of his collection consists of illustrations—including several original pieces by Rockwell, whose work directly inspired the all-American idealism of his first major film, “American Graffiti.” Lucas also owns several pieces by Parrish, whose work he says directly inspired the look and feel of his “Star Wars” epics. Lucas also owns many pieces of comic and cartoon art, including original Disney illustrations and artwork from Mad magazine—which he says should be considered as influential as other forms of art because of its design, accessibility and reach. In an interview with CBS News in March, Lucas acknowledged that many people in the contemporary art world might look down their nose at his collection, which he acknowledges is largely idealistic and sentimental. But Lucas argues the work is important because it encourages people to dream—as he did when he first saw a Rockwell painting as a young boy growing up in Modesto, Calif., where his father sold office supplies and ran a tiny walnut farm. Fascinated by what he says was Rockwell’s ability to tell a story within a single image, Lucas says he aspired to be an illustrator, too, but that he gave up that dream because his father was skeptical he could make a living as an artist. But his obsession with illustrations didn’t stop. An avid reader of Life magazine, the Saturday Evening Post and other magazines of the era, Lucas was fascinated by the contrast presented through photographs versus the optimistic world that Rockwell portrayed in his art. He says it taught him to embrace his imagination as a filmmaker. The museum, if approved, would also have elements likely to thrill the fans of his “Star Wars” films. According to his proposal, the museum would also emphasize storytelling through digital technology and visual arts—and, according to his office, would include props and set designs from his films. A decision will be made later this year or early next year about development rights to the land, according to Dana Polk, a spokeswoman for the Presidio Trust. Already, the trust has received hundreds of letters from the public on the project—most in favor of Lucas’ museum. But as appealing as a fully paid-for museum might be to a national park whose operating budget comes directly through public funds, Lucas isn’t leaving anything to chance. In recent weeks, he launched a Facebook page rallying for public support. And the filmmaker has submitted letters of endorsement from several high-profile friends, including directors Martin Scorsese and Francis Ford Coppola—a former Presidio board member who also has roots in the Bay Area and wrote to defend the idea of a museum dedicated to digital art. Lucas has also submitted letters of support from the heads of the Smithsonian American Art Museum in Washington, D.C., the Getty Museum in Los Angeles and the American Academy of Arts and Sciences—all of whom argued that a museum focusing on illustration would finally give an important art form its due. According to Perry, Lucas has been steering the museum efforts himself. He says while the filmmaker is hopeful that he will be able to build the museum in San Francisco, he did not rule out the possibility of taking his gift elsewhere if the Presidio rejects the facility. He said there has already been interest from other cities in hosting the Lucas Museum—though he declined to offer further details.